This chapter presents a case study of the preparation and passage of Ethiopia’s 2013 Seed Proclamation. It begins by identifying the main differences between the previous laws that governed seed sovereignty in Ethiopia and the 2013 Seed Proclamation. It goes on to describe in detail the process by which the 2013 Proclamation was passed. It then provides a detailed analysis of the main actors involved in the decision-making process and their motivations. It shows that the 2013 Seed Proclamation in Ethiopia is consistent with a transformationalist interpretation of seed sovereignty in which certain rights were given over to international corporate and commercial interests, but where the Ethiopian government also maintained control over various aspects of seed policy. ACB. 2015. 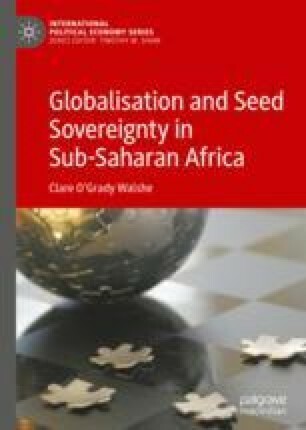 The expansion of the commercial seed sector in sub-Saharan Africa: major players, key issues and trends [Online]. Available from: www.acbio.org.za [Accessed 3rd February 2016]. Bioversity International. 2015. National implementation of the international treaty on plant genetic resources for food and agriculture [Online]. Available from: http://treatylearningmodule.bioversityinternational.org/fileadmin/templates/learning/upload/eng.policy_module/Handouts_1-12/Handout%209%20National%20implementation.pdf [Accessed 10th April 2017]. Broek, J.A. van den. 2015. Business opportunities report seed #4. Centre for Development Innovation (CDI) [Online]. Available from: https://www.rvo.nl/sites/default/files/2015/11/Rapport_Seed_Ethiopi%C3%AB.pdf [Accessed 10th April 2017]. IDLO. 2013. Strengthening Ethiopia’s agricultural sector [Online]. Available from: www.idlo.int/english/WhatWeDo/Programs/Ethiopia/Pages/ProjectsDetails.aspx?IDPRJ=61 [Accessed 2nd November 2013]. Waithaka, M., Nzuma, J., Kyotalimye, M. and Nyachae, O. 2011. Impacts of an improved seed policy environment in Eastern and Central Africa [Online]. Available from: https://www.asareca.org/~asareca/sites/default/files/publications/Impactsofanimprovedseedpolicyenvironment.pdf. [Accessed 2nd June 2016].